You save £54.00 that's 49% off! 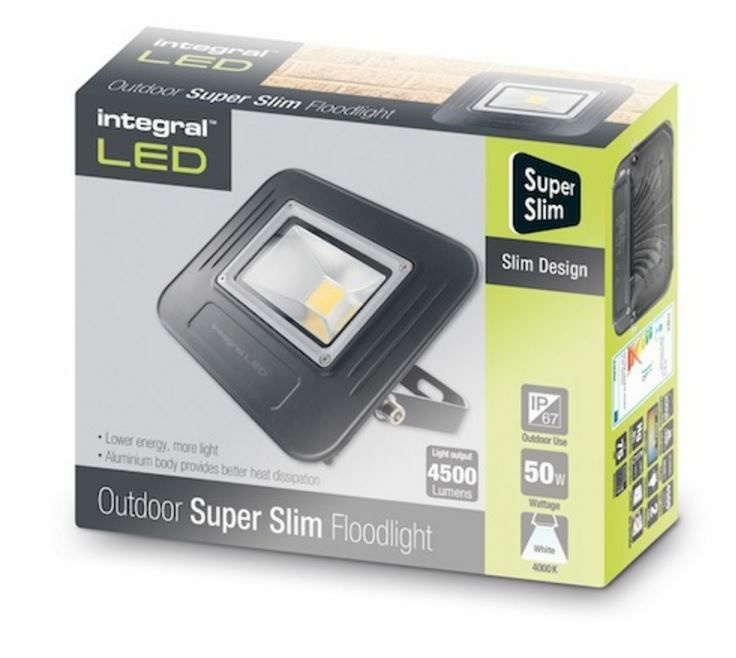 This led flood light maunfactured by INTEGRAL LED only uses 50 watts of power which means that the floodlight will be much more economical than an equivalent halogen or halide light producing more lumens per watt. 50 Watts may not sound much, but this light is capable to illuminate quite large area and will be suitable for most people basic needs equivalent to a traditional 500 watt floodlight. The bulb operates at 240 volts so no transformer is required. Light output of this led floodlight is approximately 4500 lumens curtosy of the superior BRIDGELUX chip. Many similar products only mange to produe 3500 lummens at this wattage. If you need to illuminate your front door, driveway, garden shed or some particular area in your backgarden, this product will do it without any problems. The beam angle of this led flood light is 120 degrees, which is considered a wide beam angle for this type of lamp, so it will light not only directly in front of the lamp, but also spread on the sides. The actual light is cool white, with a colour rending index greater than 80 and a powerfactor greater than 0.9. This specification represents exceptional quality and performance normally only available in commercial products. The floodlight lamp itself is made with a black aluminum casing and sealed with rubber to make it waterproof to IP67 to withstand outdoor weather conditions all year round. Please note this product is not suitable for underwater usage. LED floodlights can keep your garden illuminated long after the sun has set. Your garden can transform into an usable space in the evenings by benefiting from some light. This 50w floodlight is easy to install and most DIY experts should not have a problem fitting this product. However if in any doubt we recommend that a qualified electrician should be used. In some cases the floodlight may need to be mounted onto a pole to achieve the desired lighting levels for a given area. Commercial customers have the opportunity to reduce their lighting bills considerably up to 90% by switching their existing halogen floodlights to LED floodlights. Not only do LED floodlight consume less power, they have a much longer average lifespan. This is especially important when floodlights are used to light areas such as car parks, walk ways, driveways etc. where lighting is required for security. We guarantee that you will not be disapointed with this product. I was looking to replace the halogen floodlight in my garden with a LED version. Many of the floodlights I looked at a similar price were only available in daylight or cool white and I required warm white. I also noticed that products that were the same wattage produced considerably varying amounts of light differing by 500 to 1000 lumens. This product specification stated warm white and appeared to be brighter than others so I made the order and it arrived in a few days. Once wired in I was surprised that only 50 watts produced a bright warm white light almost identical to my old floodlight. I would recommend this product to anyone looking to get a flood light for their garden. Hopefully this should last quite a few years.